Next, we are going to introduce Sudharshan from NUS High School of Mathematics and Science, who will be showcasing projects he has made under the umbrella of the NUS High School’s Engineering Interest Group (EIG) and some other projects made by like-minded friends. Together with Sudharshan at his booth would be his friends Isaac Tay and Jia Cheng from the same EIG. Sudharshan is a 15-year-old student from NUS High School who is also part of its Engineering Interest Group(EIG) where students who are passionate about engineering come together and work in pairs or trios on different projects. Sudharshan shared that he has been interested in electronics and engineering in general since he was ten years old. He enjoys fixing or simply taking apart broken electronics to find out how they work. As his interest developed, he began to work on actual projects such as blinking LED lights with 555 timers. Over time, he accumulated certain skillsets (such as programming languages in C, C#, Java and Arduino programming) that allowed him to work on more advanced projects. We noticed some gaming-related projects and asked if Sudharshan is an avid gamer. It turns out to be otherwise. Sudharshan’s motivation for making gaming devices came out of his problem-solving resolute. While he is not a gamer, he has been inspired by a gaming friend who had faced challenges using both the keyboard and the mouse when gaming. This has inspired Sudharshan to add more axes to the gaming mouse so that his friend can play the game without using the keyboard. This totally resonates with what our other Maker Elda Webb has shared with us before, that making is a process of problem-solving. I think Sudharshan’s making journey is exemplary of that. In fact, Sudharshan personally prefers to spend his time documenting engineering ideas, working on his engineering projects and keeping a blog to document them. Sudhshan also acknowledged the importance of family support. Indeed, his parents should be lauded for encouraging his creative mind! 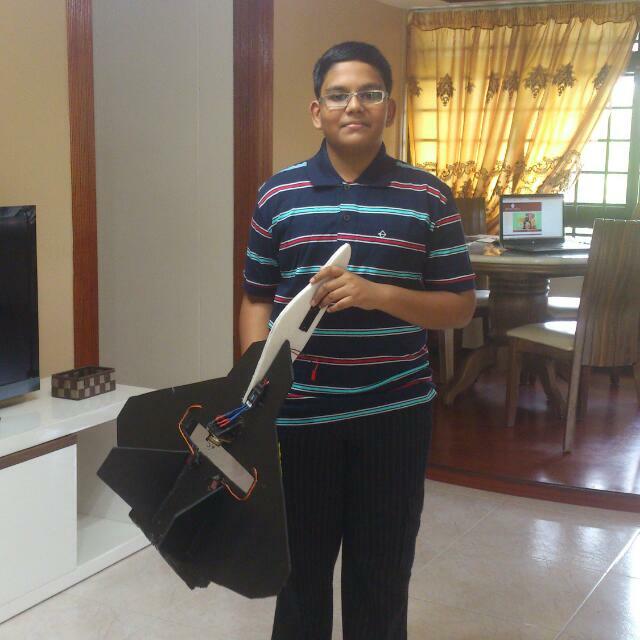 Sudharshan was collecting his prize for the Autodesk Design Challenge at the Singapore Mini Maker Faire 2014 when he first touched base with the Singapore maker scene. Since then, his interest was piqued and he began to follow the local maker scene and look out for updates on the Maker Faire Singapore 2015. How can we encourage more Singaporeans to make things? Sudharshan is a strong proponent of the maker movement, and he felt that many Singaporeans love to throw away things rather than fixing them. He felt that this would need to be inculcated in the thinking of the young, by shifting focus away from academic achievements. A rather mature view, isn’t it? Don’t forget to check out Sudharshan’s booth this coming weekend on 11 & 12 July at 15 Tampines Street 11.